WILLEMSTAD - Today, Lieutenant Colonel James E. Wells relinquished command of the United States Forward Operating Locations (USFOL) on Curaçao and Aruba to Lieutenant Colonel Joseph T. Clancy III. The Change of Command is a time-honored military tradition which symbolizes the continuation of leadership and unit identity despite the change in individual authority. Passing the ceremonial flag from the old commander to the new commander physically represents this transfer. Present at the ceremony were Colonel Kim Campbell, Commander of the 612th Theater Operations Group and 47th Air Expeditionary Group, Headquarters Twelfth Air Force, Davis Monthan Air Force Base, AZ, Deputy Governor of Curacao Nolda Romer-Kenepa, Prime Minister of Curacao Eugene Rhuggenaath, U.S. Consul General Margaret Hawthorne, Minister Armin Konket, Deputy Commander of the Netherlands Forces in the Dutch Caribbean Captain Jan Willem Boone, and other invited guests. 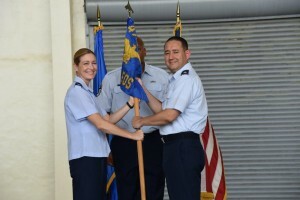 Lieutenant Colonel Wells distinguished himself in the performance of outstanding service to the U.S. as Commander, Detachment 2, 6l2th Theater Operations Group, Headquarters Twelfth Air Force (Air Forces Southern), Curaçao and Aruba USFOLs. During this period, Colonel Wells unified the efforts of 188 military and civilian personnel supporting over one hundred counterdrug missions enabling the tracking of 368 targets and the seizure of illegal narcotics worth US $180 million. Furthermore, together with 264 other volunteers he supported 73 charity events that added US $127,000 in resources and services to 5,600 people. These efforts enhanced their quality of life and strengthened international partnerships. Additionally, Colonel Wells directed humanitarian assistance and disaster relief during two category 5 hurricanes. He established an aerial port of demarcation for the Royal Netherlands Caribbean Command and provided logistical support for 150 personnel from the 53rd Weather Reconnaissance Squadron, enabling the transfer of over one million tons of aid and the timely evacuation thousands of people. His successor, Lieutenant Colonel Clancy was the Deputy Director of Operations for Twelfth Air Force, Air Combat Command, Davis-Monthan AFB, Arizona. Change of CommandMilitaryU.S. Forward Operating LocationU.S.A.